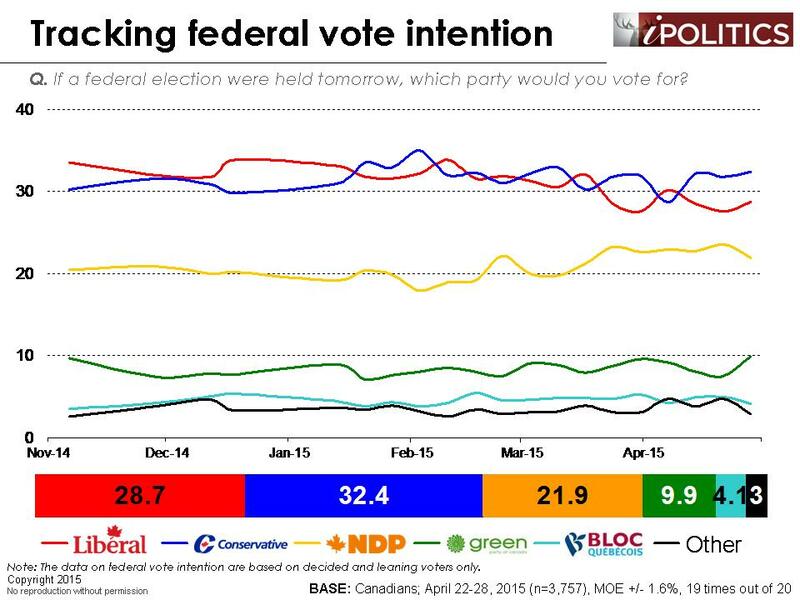 [Ottawa – May 1, 2015] Overall, vote intention seems frozen in amber as the three lead parties have been stuck oscillating within tiny ranges over the past few weeks. 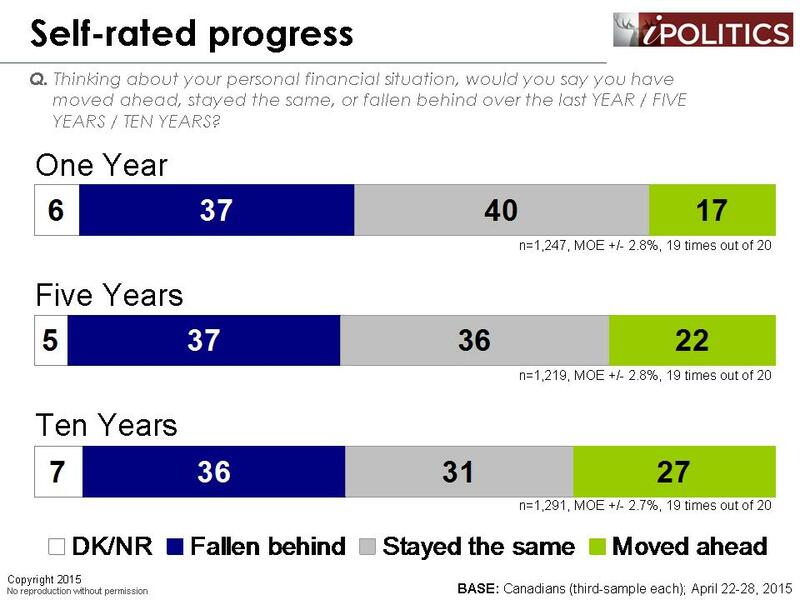 While nothing is changing in aggregate, there are interesting shifts in certain segments which seem to reflect the impact of a highly visible budget that was forcefully communicated to Canadians through all of the communication tools available to an incumbent. Yet even now, we see that attention is flagging. The Conservatives are hanging on to a just barely significant lead over Justin Trudeau’s Liberals – well short of the levels they would need to repeat their majority. 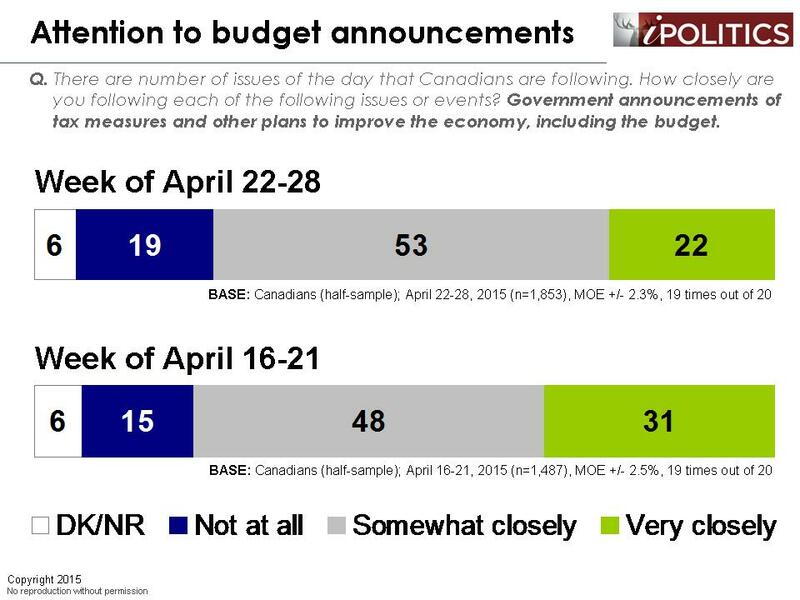 The budget was highly visible; this is evident in that three-quarters of Canadians say they recall hearing about it and it is reinforced by the high level of attention to budget announcements that we noted last week. 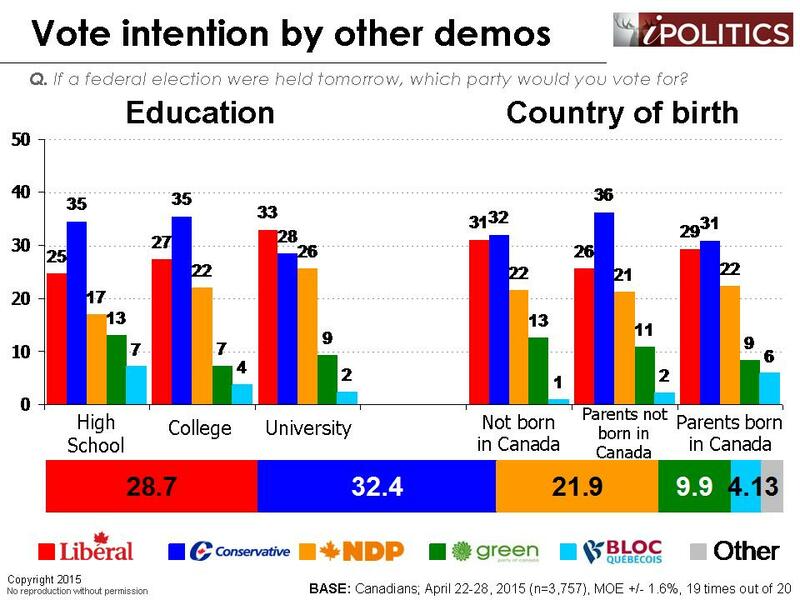 The fact that there has been no net change on vote intention is not because Canadians are simply not paying attention (quite the opposite, in fact). The budget is simply not having an overall effect. Overall, the budget was not well received. While it was not a disaster, responses were underwhelming, and negative reactions outnumber positive ones by a margin of 2-to-1. 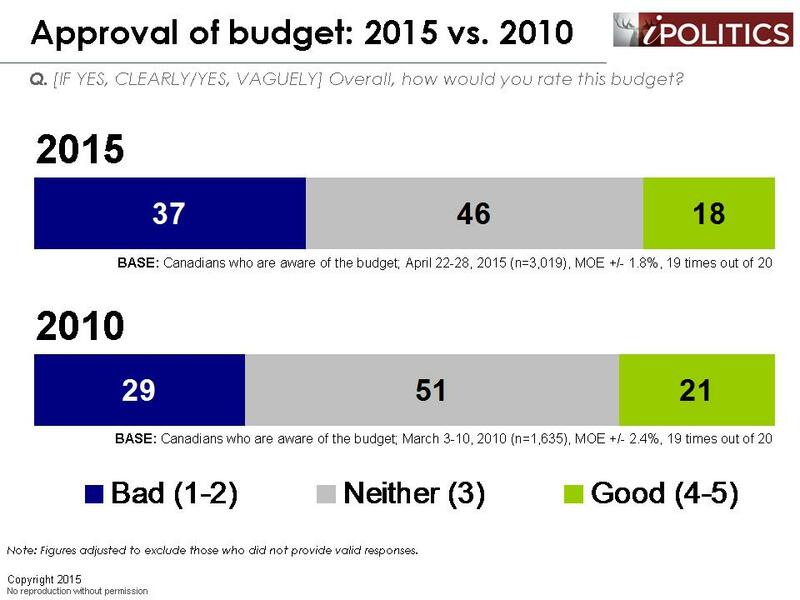 Furthermore, not only was the budget poorly (or indifferently) rated, it’s seen as having almost no positive consequences for average Canadians. 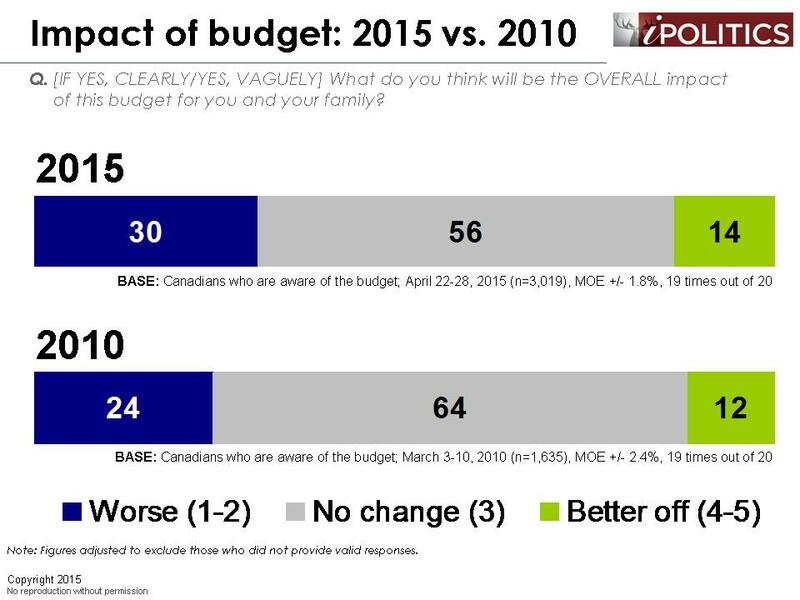 A clear majority of Canadians see the budget has having no effect and of those who do, most see themselves as being worse off. On both indicators, this budget fares worse when compared to the 2010 budget. Indeed, for all the effort and framing and communication that went into this budget, the fact that it has failed to create so much as a ripple in the voter landscape has to be a source of considerable concern fro the Conservative Party. Continued shift of seniors to Conservatives: gerontocracy redux? 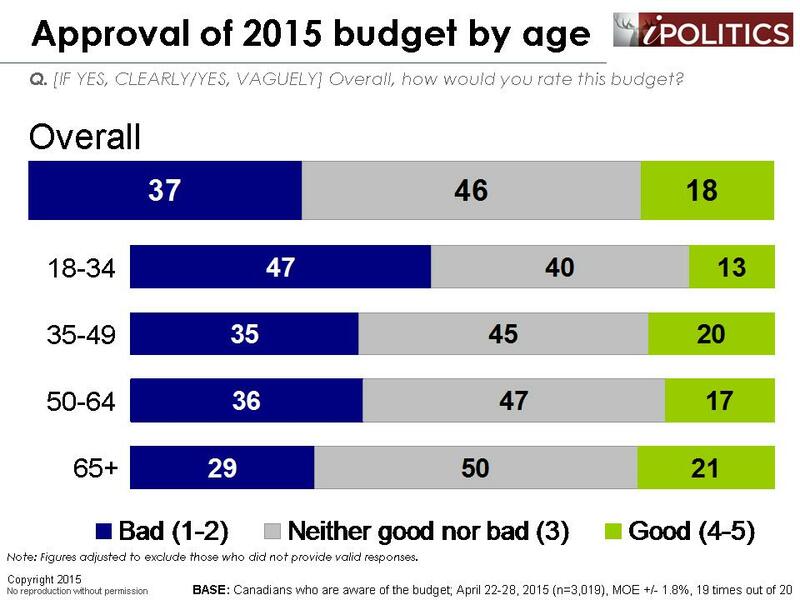 Despite a rather blasé response from Canadians in general, the budget appears to have worked relatively well with seniors. While the reaction from seniors was lukewarm as best, seniors are less likely to disapprove of the budget and are least likely to see it as having a negative impact on their personal outcome. Could this be improving the Conservative Party’s already strong fortunes with seniors? 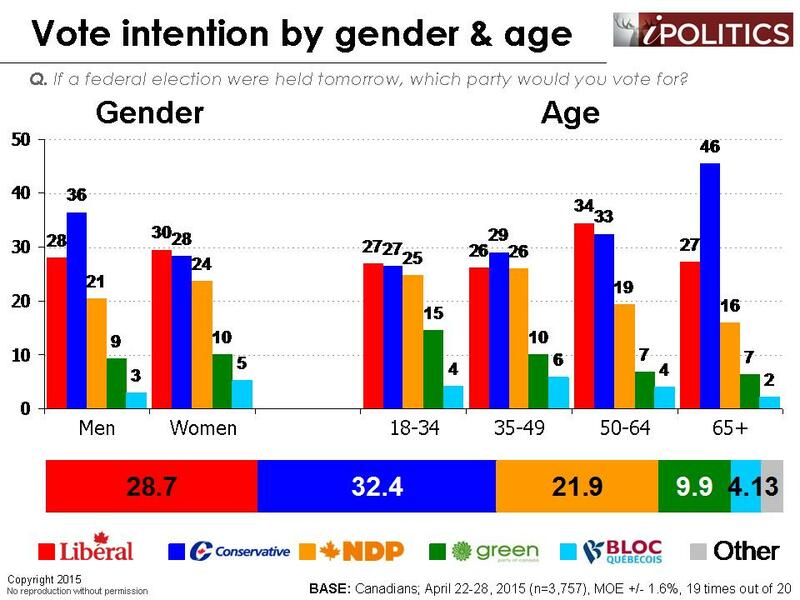 The answer is most likely yes, and the profound nine-month movement of seniors to the Conservatives is by far the most important dynamic in an otherwise placid voter landscape. Indeed, the generational fault lines across seniors and pretty well everyone else have never been larger. Almost half of seniors are going Conservative and hence they are exerting enormous influence over the political future. Pretty much everywhere else, however, the budget has been received quite poorly. Outside of seniors, Conservatives are nowhere near to forming a stable government. In any case, attention to economic announcements appears to be declining, which suggests that the current government’s ability to hold public attention with tax breaks and announcements about the budget is beginning to wane. Again, this does not augur well for the current government’s future. The government’s economy is a warm and happy place, but seen through the lens of the worker, consumer, and citizen, it’s a distinctly dark place and there is no evidence that the gloom is dissipating. We are tracking this issue carefully, and by all indicators everything looks awful. The rear-view mirror is dark and seems to be getting worse, while outlook on the future is equally bleak. We have recently received criticism from an economist who noted that our question on current state of the economy offered three “negative” options (i.e., depression, severe recession, and mild recession), but only two “positive” ones (moderate growth and strong growth). In response, we have conducted a test where half of respondents received our standard question and the other half were a new version with a sixth “positive” option (an economic boom). 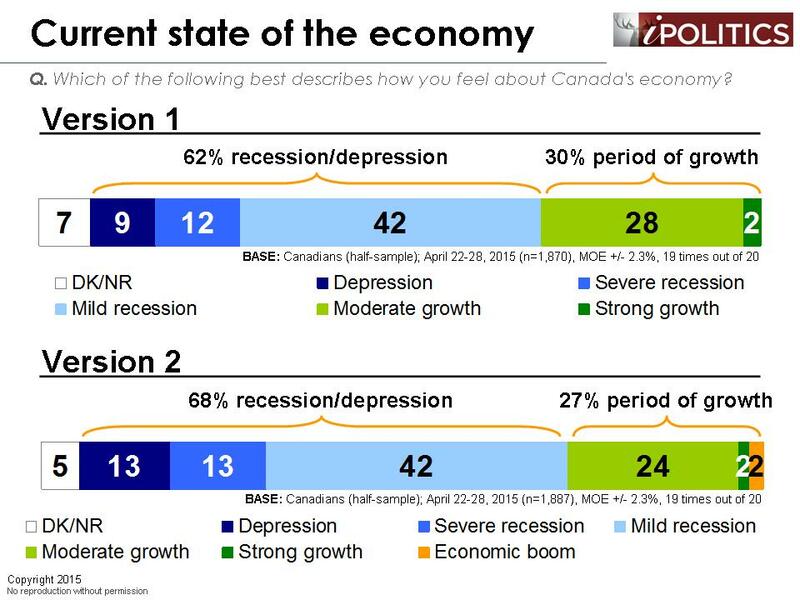 We found that both versions produced similar results and, interestingly, respondents who were prompted with the economic boom option were actually more likely to say the economy was in a recession or depression. The budget was and is a critical framing document for the government. It represents the culmination of many of the Government’s key economic promises (balanced budget, income splitting, etc.) and hence becomes a proxy for promise delivery. It also provides a promise for the future and lays out the economic plan for the coming year(s). This budget also received extraordinary communication efforts which were clearly echoed in our sounding of where the public is drawing information and what things are registering for voters. Coming in the lead up to the fall election the stakes could not be higher for the government. Given that, there must some trepidation among Conservative party strategists. There was no failure of communication; the government owned the airwaves (and the tax inserts) and their messaging drowned out all other sources. Interestingly, this salience is already dropping as playoff fever rises and cottages beckon. The government may also have reached the limits of targeted goodies and inducements that it has sprinkled to key constituencies. And what are the net results to date for these heroic efforts? Zilch. Nada. The dials didn’t budge a whit. The Government sits exactly where it was for the past three weeks – mired at 32 points. Contrary to the government’s cheery economic narrative, most of Canada is registering record lows on how well they are doing compared to the past and even worse on how well they are going to do in the future. Less than one in three think we are not in recession and most are looking for some acknowledgement of the depths of stagnation and pessimism about the future. The huge public concerns about declining middle class progress and rising inequality at the top aren’t even given a perfunctory nod in the budget. If anything, the budget seems to signal continued pursuit of minimal government and tax relief as a strategy for restarting an economy which many see as victim of exactly those policies. The reverse Robin Hood model of targeting relatively affluent voters with tax incentives is also not playing well with the vast majority of those who see nothing or back sliding as the results of the budget. 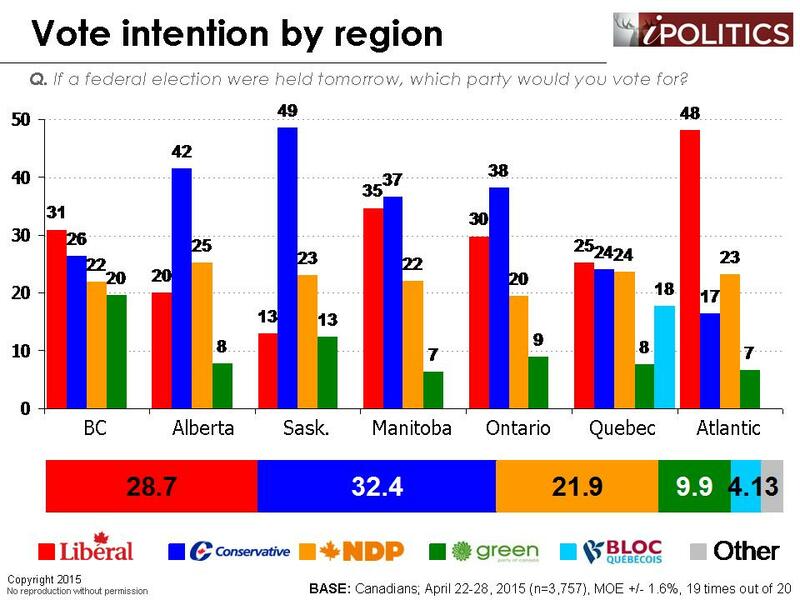 For those thinking that the moribund economy isn’t an issue, please check back on Tuesday when an NDP government is installed in Alberta by a deeply anxious and angry electorate. The upside for the Government is that the opposition parties have not been able to convince the voters that they have better answers to these pressing problems. We will have to see whether the coming months will see an opening for them to grab the microphone and communicate their ideas and values. With the government having shot its bolt and exhausted its fiscal degrees of freedom to regroup, this will be a most interesting period in what is now a very lively electorate. The field dates for this survey are April 22-28, 2015. In total, a random sample of 3,757 Canadian adults aged 18 and over responded to the survey. The margin of error associated with the total sample is +/-1.6 percentage points, 19 times out of 20. A smoke and mirrors budget which is being over-hyped at taxpayers expense. The closer you parse it the more inept and clumsier it becomes. 500+ pages of BS from a government that is losing any shred of its tenuous acquaintance with reality. Surprising that seniors being bribed with their (our) own money are so happy to take that wealth from their own health care and childrens’ pockets.